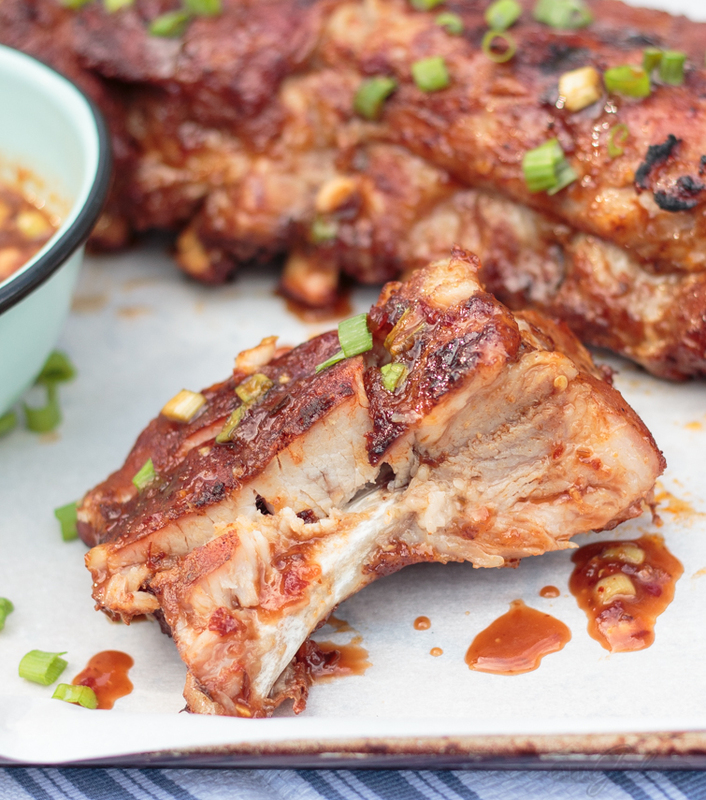 These Asian sweet & spicy grilled baby back ribs are going to be the star of your next cookout! 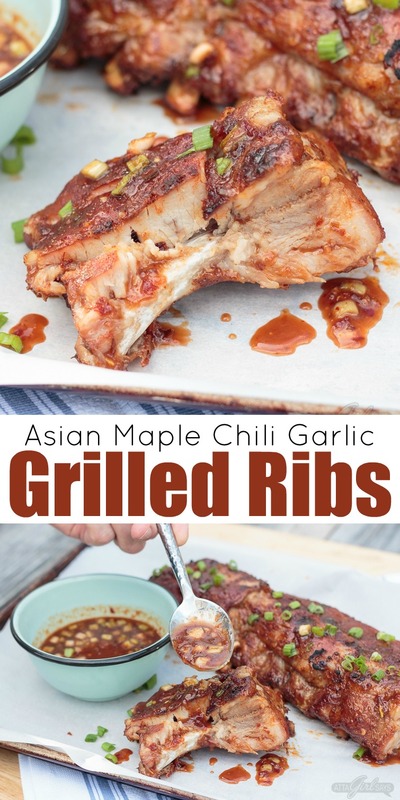 Seasoned with a delicious homemade spice rub and slow cooked on the grill until they’re fall-off-the-bone tender, the ribs are finished with a maple chili garlic sauce. You’ll feel like a champion pitmaster every time you serve these! 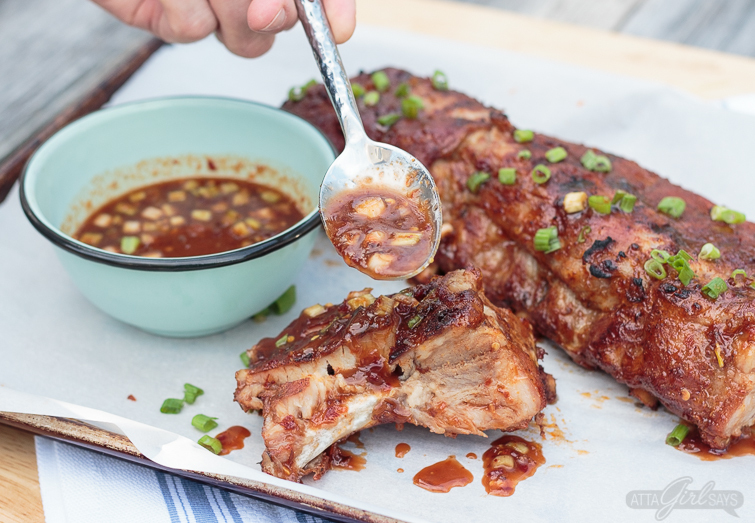 I didn’t think I could top the tried-and-true ribs recipe that I seem to I serve at every cookout and family gathering during grilling season. 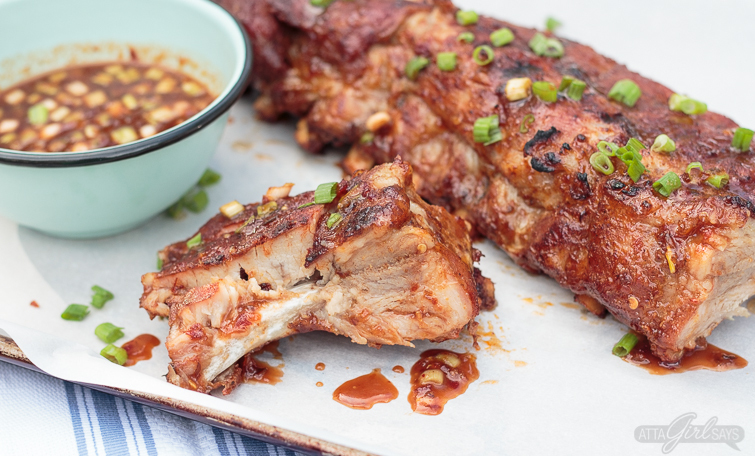 Until I made these sweet and spicy Asian-style grilled baby back ribs. That rub. That sauce. That tender, juicy pork. And all without ever turning on the oven. These ribs are cooked, start to finish, on the grill. 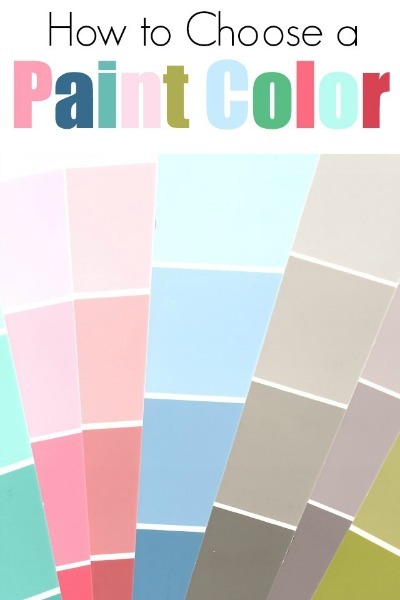 And they really couldn’t be easier to make. You just rub ’em, wrap ’em and cook ’em slow and low on the grill for several hours before finishing them over the flame with sauce. It really is that easy! Just don’t tell my family that. Because I had them convinced I was at home working hard on our dinner while I sent my husband and son out to run some errands. But really, I was just hanging out on our patio, reading and enjoying the spring sunshine while the grill did all the work. I think a lot of cooks are intimidated by ribs, but they’re not hard to make at all, nor are they labor intensive. As far as grilling goes, ribs are pretty hands off. 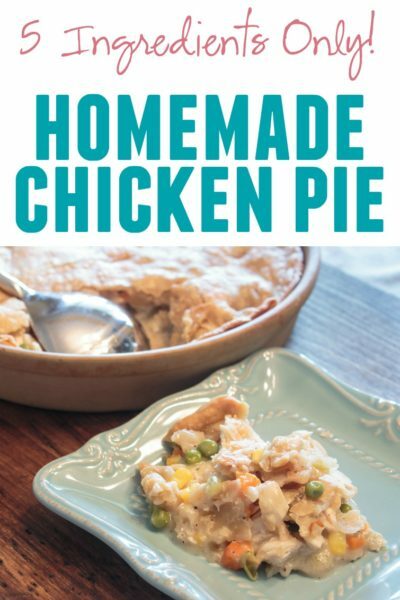 That makes them a perfect choice for cookouts, as well as weeknight meals, when you’ve got other stuff to do to get ready for guests and get dinner on the table. My secret for perfect grilled baby back ribs is to cook them slow and low, wrapped in a parchment and foil packet. I always use Smithfield Extra Tender Pork Back Ribs because I know the finished meal will be juicy and tender. The name kinda says it all! Smithfield Ribs are hand-trimmed, extra-tender and juicy, and they have no added hormones or steroids. 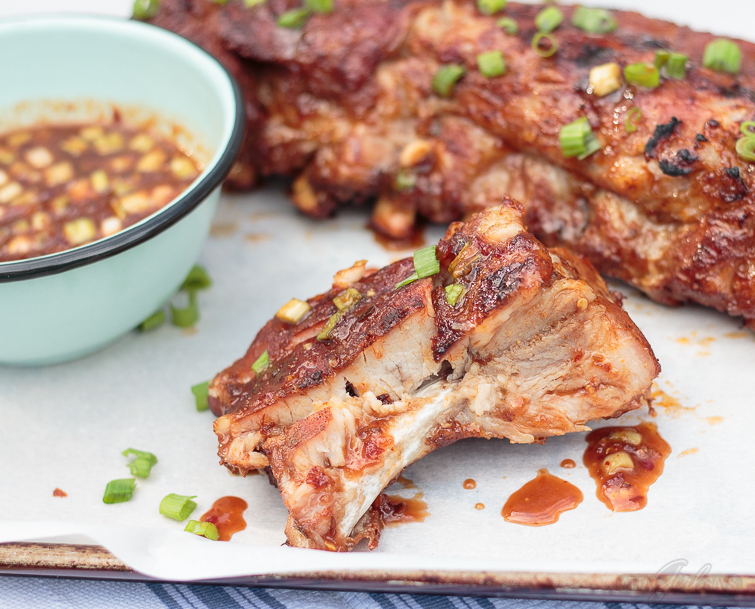 I also use a homemade spice rub, made with kosher salt, brown sugar and spices, to make the grilled baby back ribs even more tender and flavorful. Right now, you can earn $1 with the purchase of any Smithfield® Rib product at Walmart when you use the Ibotta app. 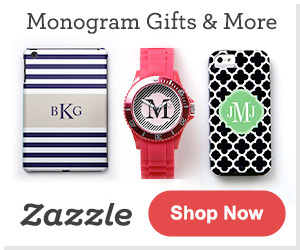 Just click the image above to get started earning! 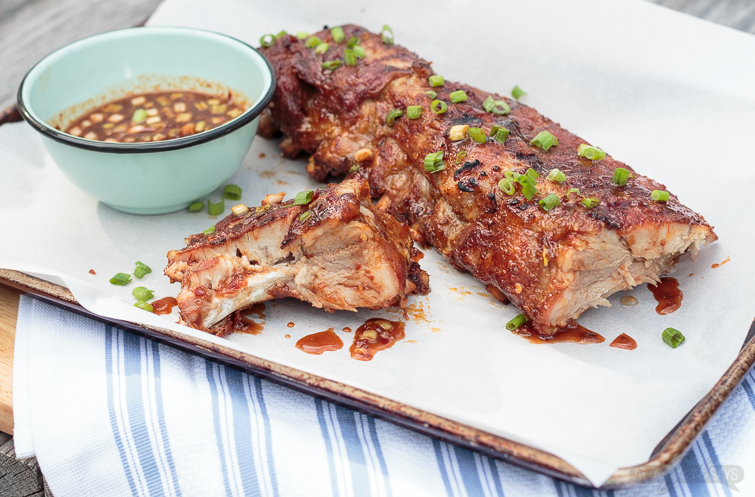 For these Asian-style grilled baby back ribs, I changed up my normal rub and added a little ground ginger, cloves and chili powder to the mix. The rub recipe, which is included below, makes enough to season several racks. 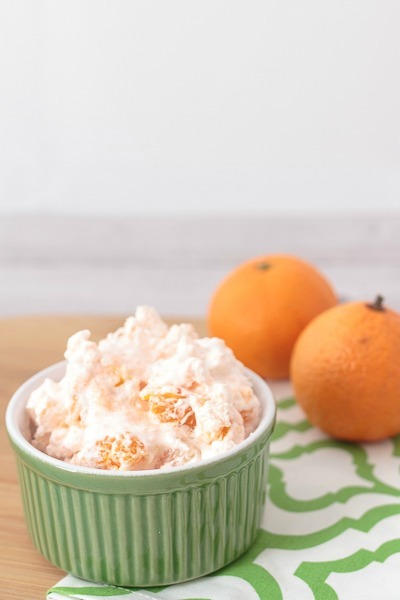 It should stay fresh in your pantry for up to a month when stored in a sealed jar. 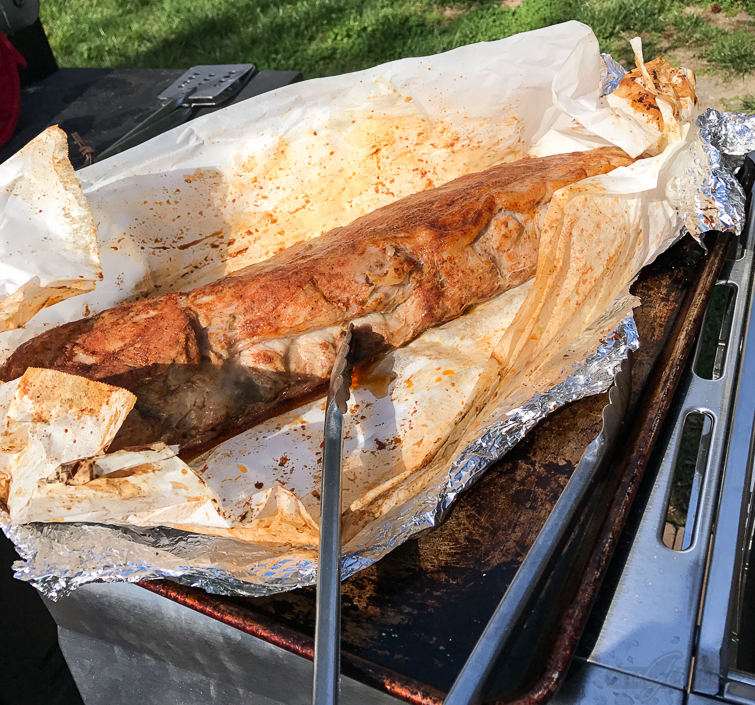 While you can cook Smithfield Fresh Pork directly over on your grill grates, I like to double wrap the rack of ribs in parchment paper and foil to lock in moisture and create steam as they cook. The key is to create a tent with the parchment and foil, rather than tightly wrapping them. But you do want to make sure the packet is sealed so the liquid doesn’t escape while you’re cooking. The last step for great grilled baby back ribs is to add the sauce and let it caramelize on the grill. 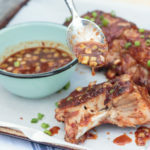 For these Asian-style ribs, I made a version of my sweet and spicy wing sauce using maple syrup, sweet chili sauce and green onions. 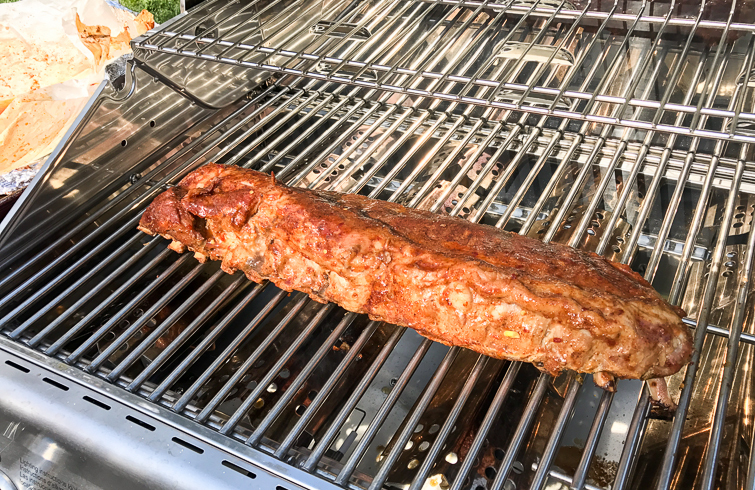 Brush generously on both sides of the ribs, and grill over medium heat, flipping at least once, until the sauce is slightly caramelized. 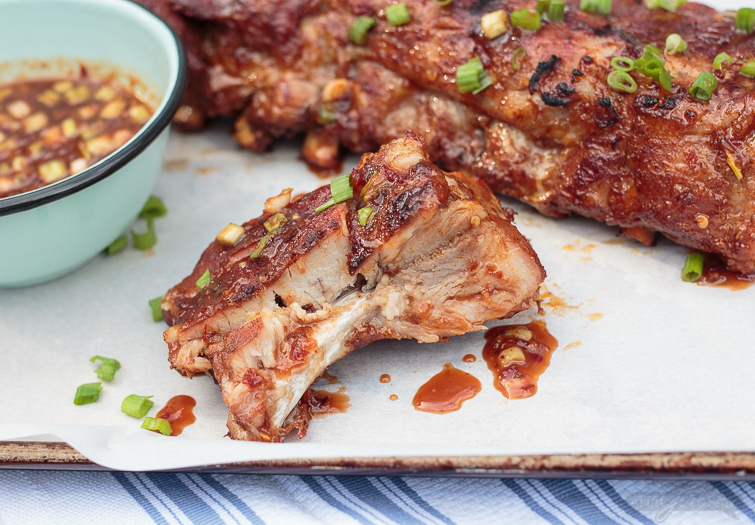 Be sure to save the extra sauce to drizzle over the ribs when you serve them. Combine the brown sugar, salt and spices in glass jar and shake to combine. Prepare the ribs by removing the membrane. 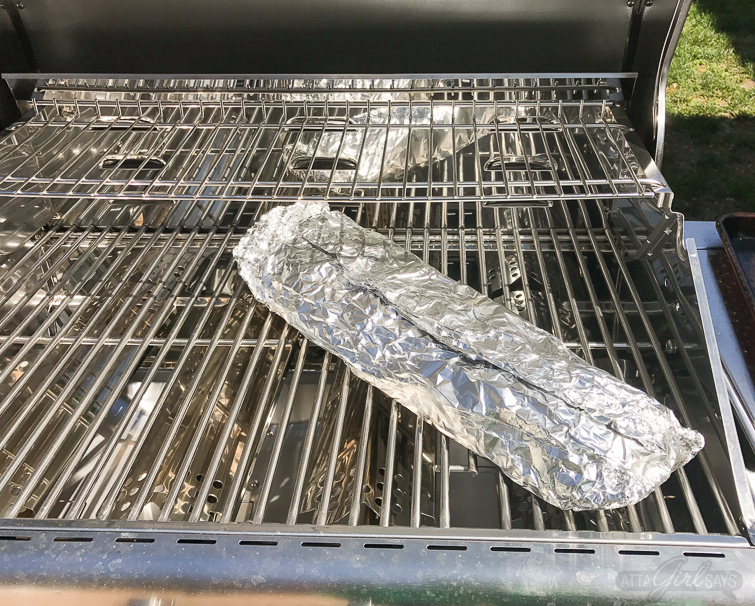 Place two large pieces of foil, overlapping in the center, on a rimmed baking sheet. Top with a large piece of parchment paper, which is big enough to encase your rack of ribs. Fold parchment over the ribs, sealing along the center and at both ends. Then fold the foil over the parchment-encased ribs. Preheat the grill to 300 or 350 degrees. Place the wrapped ribs on the grill and cook for 2.5 hours. Remove the ribs from the grill and let rest for 10 minutes. 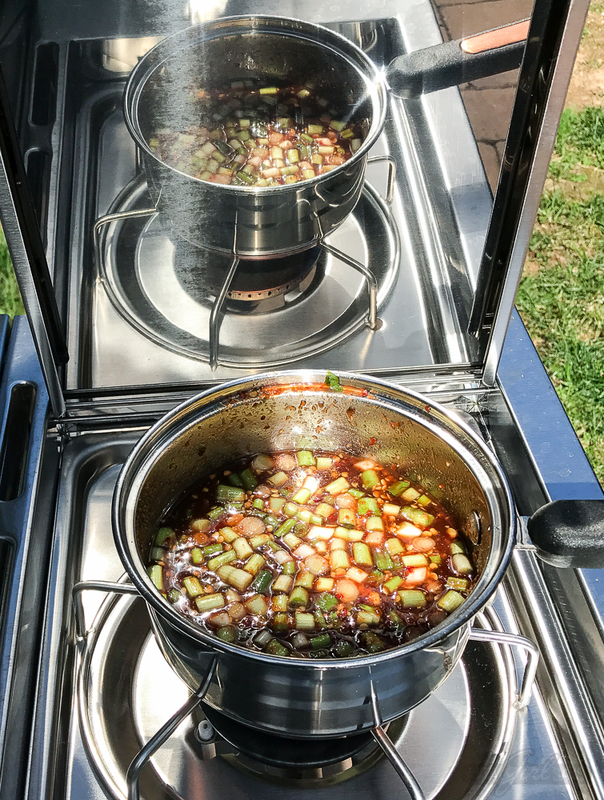 While the ribs are grilling, prepare the sauce. Combine the maple syrup, sweet chili garlic sauce, soy sauce, Dijon mustard in a small saucepan. Heat over medium, stirring frequently to prevent burning. Meantime, in a measuring cup or small bowl, mix the cornstarch with warm water, stirring until it is dissolved and all lumps are gone. When the sauce begins to bubble at the edges, add the cornstarch mixture to the saucepan. Simmer over medium-low heat, stirring constantly, until the sauce thickens. Remove the sauce from the heat, cover and set aside until you're ready to baste the ribs with it. Once the ribs have finished resting, carefully unwrap the foil and parchment packet being mindful of steam that may escape. Check the ribs for doneness. A knife should pierce the meat easily with no resistance. If they are not done or as tender as you would like, rewrap the ribs and return them to the grill for another 15-30 minutes. When the ribs are cooked through and tender, remove them from the parchment and foil packet. Return them to the grill over a medium flame and cook for 10 to 15 minutes more, flipping once and brushing both sides with sauce until lightly caramelized. 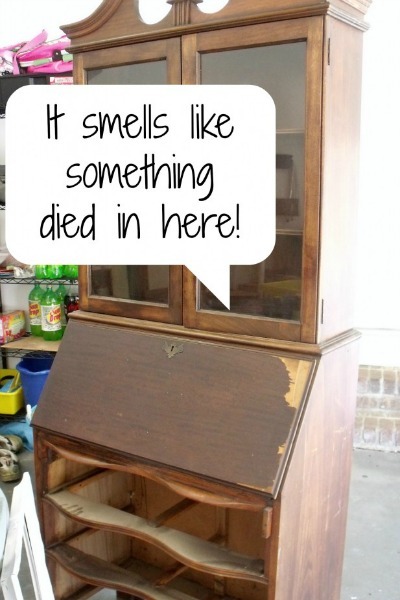 The messier the ribs, the better they taste! 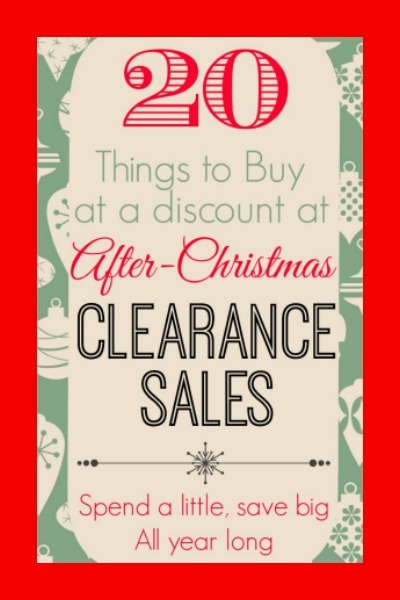 Better grab some extra napkins, or a whole roll of paper towels for these! Or just give every a kitchen towel to use as a big and napkin. I like to serve these ribs with grilled corn on the cob and a kale salad or Asian-style slaw. 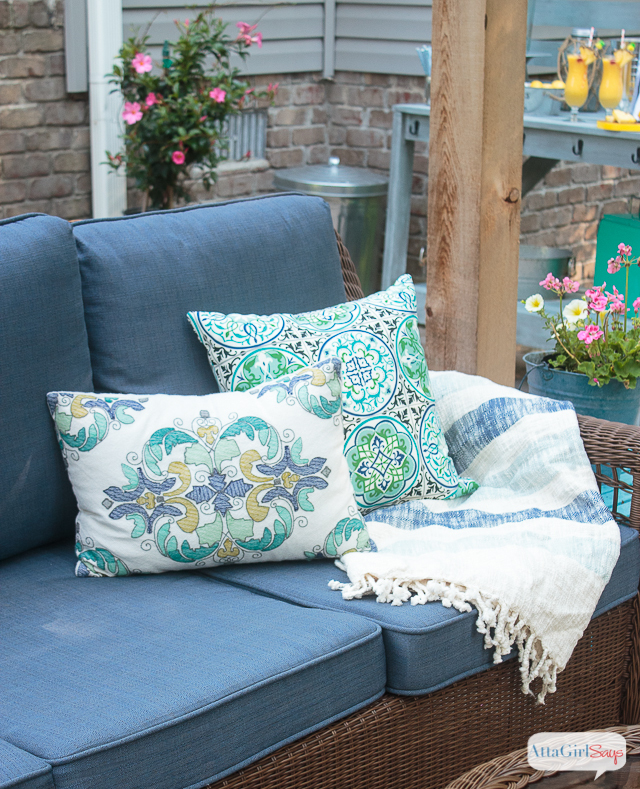 When you’re grilling out this spring and summer, you can’t go wrong with Smithfield®. 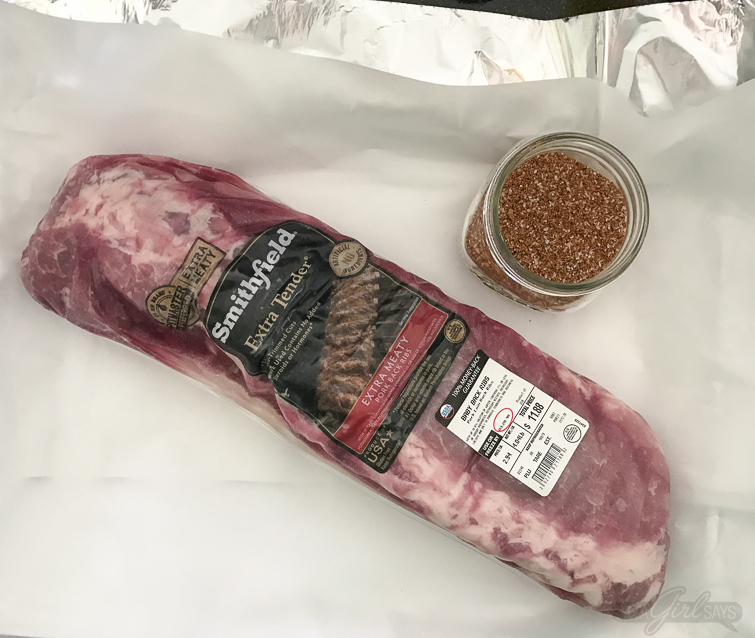 Championship pitmasters, like Tuffy Stone, use Smithfield Fresh Pork in their competitions and on their backyard grills because they know the quality of the meat matters as much as their secret rub and sauce recipes. 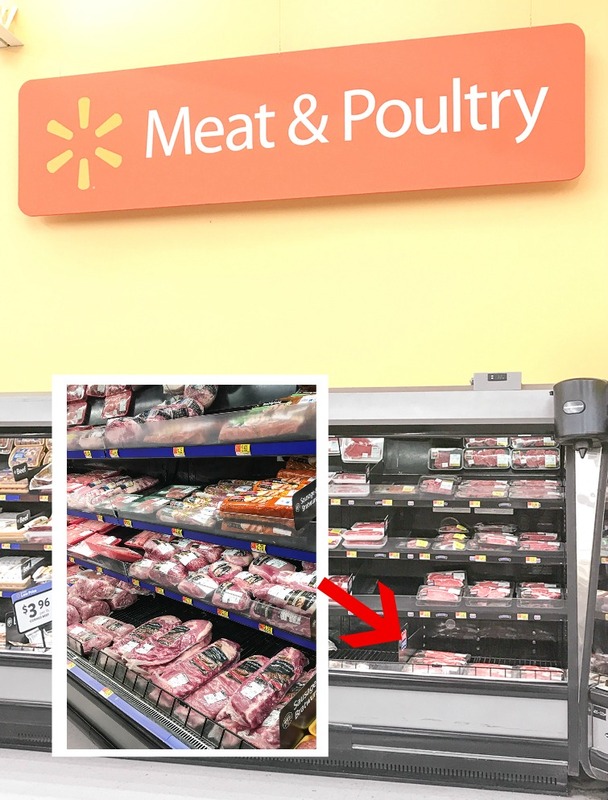 Don’t forget to head use the Ibotta app to earn cash when you buySmithfield® Fresh Pork at Walmart.